WHEN IT COMES to exchanging information, texting is about as casual as it gets. You can communicate with someone without actually talking to them, send quick abbreviations, and you aren’t required to use complete sentences. Still, no matter how efficient texting may be, you should always be aware of the context when sending a text, particularly if it’s a professional relationship. If you’re texting colleagues, bosses, employees, customers, pets, friends, or family, there are a few etiquette rules you should abide by, says career coach Barbara Pachter in her recently published book “The Essentials Of Business Etiquette“. 1. Be careful with abbreviations. Texting is meant to be a fast form of communication, so it’s common to use abbreviations and shortcuts such as “LOL” (laugh out loud), “np” (no problem), or “u” (you). But there is such a thing as an inappropriate abbreviation. “Using shortcuts has become more common in the business world, but make sure it’s appropriate for ‘u’ to be that informal,” says Pachter. If you choose to use them, Patcher suggests only using those that are widely known, which the receiver would understand the meaning of. And with shortcuts that lean toward the unprofessional — “WTF,” for example — a good rule of thumb is to only type what you would be comfortable saying out loud. Ultimately, the safest route is to type out the entire word or phrase. And of course, make sure you know exactly what they mean, unlikely the mother of one reader of TheDailyEdge.ie. 2. Be aware of your tone. When you’re writing short and fast, you’re not thinking about your tone and “your text may sound harsher than you intend,” Pachter says. Try to write in complete sentences to prevent sounding abrupt, and always read your message out loud to make sure it doesn’t sound too harsh. 3. 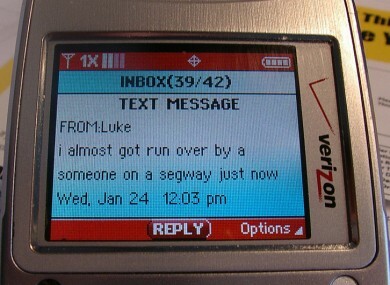 Never send bad news via text. The bottom line is that texting is too casual a medium to give bad news. It’s difficult to know what tone you’re giving off in a text message, so Pachter says it’s safer to stick to only good news when sending texts to people in your professional network. If you do want to break this rule, and break up with someone through text, there’s an app for that. 4. Don’t change meeting times or venues in a text. If you’re going to change a meeting time or venue at the last minute, give the person a call out of respect. 5. Always double check when using the voice-to-text feature. Email “The 5 rules of texting etiquette that everyone needs to know”. Feedback on “The 5 rules of texting etiquette that everyone needs to know”.